Seriously, what can we say? £21 for a hugely convincing dual Polysix emulation from the company that built the original, with touchscreen control and a whole electronic studio wrapped around it? It's a beautiful piece of work. Faithful emulation. Excellent value for money. Sounds great. iCloud backup. Some may consider it too pricey for an app. They'd be missing out. Korg is already a veteran when it comes to the iPad, with emulations of their Electribe and MS-20 hardware already on Apple's tablet. While what we really want are Wavestation and MS2000 apps, iPolysix will fill the time nicely until one of them comes along. "The original Polysix is a six-voice synth from the early 80s most notable for its affordability and fabulously warm analogue sound"
The original Polysix is a six-voice synth from the early 80s most notable for its affordability and fabulously warm analogue sound. 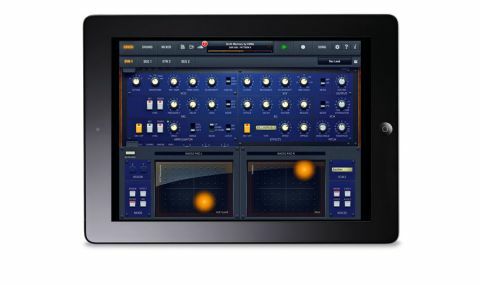 The iPad version again ticks both of those boxes, comprising not one but two synth engines, as well as a six-track drum machine that uses sampled Polysix sounds as source material. And while it might be quite expensive for the App Store, it's excellent value for money in terms of sound, features and the amount of work that's clearly gone into it. The two synths are replicas of the Polysix with a few little extras thrown in (a high-pass filter, for example), so they're eminently easy to program. Essentially, you get one oscillator (with sub) per voice, a filter, an envelope and an LFO with which to craft your raw tones. These can then be animated with the built-in arpeggiator, beefed up using the Unison feature and processed by one of a library of 28 simple but impactful effects (expanding somewhat on the original's Chorus, Phaser and Ensemble). The Polyseq 64-step polyphonic sequencer enables you to record/ program patterns for both synths and the drums, complete with parameter automation and a series of inspiring sequencing modes. Oh, and you also get two Kaoss Pads for real-time performance and modulation, a basic mixer, and project sharing via Polystage, which gives you access to other users' work for 'remixing'. In addition, the recently released Version 1.1 brings Audiobus and iCloud backup to the party, making iPolysix even more unmissable.